For those young athletes (or those young at heart) come test your skills at our park’s long jump pit and see how close you can come to Jesse Owens’ 1936 Olympic gold medal distance of 26 feet 5 5/16 inches. It was at the 1936 Summer Olympics in Berlin that Owens won four gold medals, one of which was in the long jump competition. Owens credited his win to the friendly and helpful advice he received from Luz Long, his German competitor, whom he ultimately defeated as well as befriended. 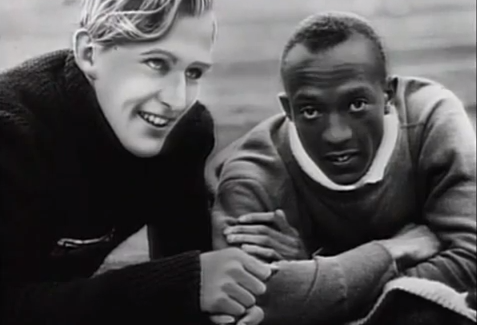 Luz Long with Jesse Owens at the 1936 Summer Olympic games in Berlin, Germany. They became lifelong friends. Owens was struggling to gain the minimum of 23 feet 5 13/25 inches that was required to advance to the Olympic finals. 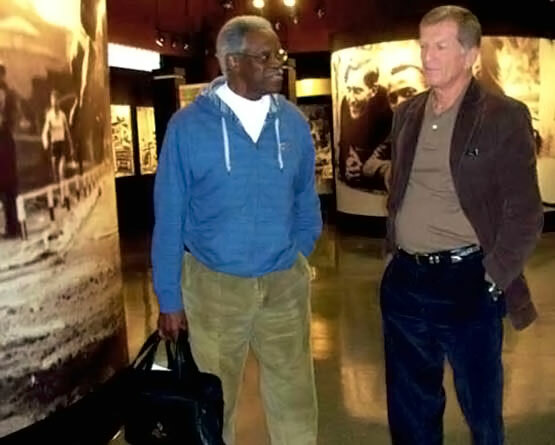 Long knew Owens routinely made distances far greater than this. He surmised that Owens was capable of safely advancing to the next round by pushing for a greater distance without risking a foul. Long introduced himself. He told Owens that he had been watching his jumps then recommended that he start several inches behind the takeoff board. Long made a mark on the ground and then suggested to Owens that he jump from that spot to ensure he qualified. Deciding to take Long’s advice, Owens started inches behind the takeoff board. On his third (and final) qualifying jump, he soared through the air and landed four inches over the qualifying distance, easily advancing to the finals. He went on to win the gold with 26 feet 5 5/16 inches as well as beat Long’s record of 25 feet 9 5/6 inches. Luz Long won the silver medal for second place and was the first to congratulate Owens. 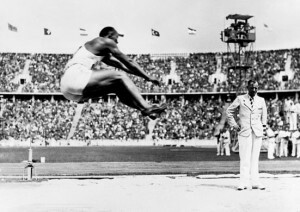 Jesse Owens winning the Long Jump event at the 1936 games in Berlin. 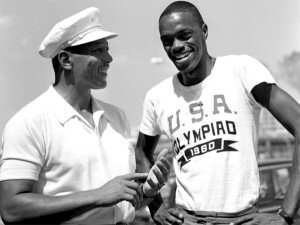 Owens accomplishments at the 1936 Olympics are unparalleled for many reasons. However, in 1935, his achievement in Ann Arbor, Michigan not only rewrote record books, but also is considered one of the most amazing feats in the history of any athletic sport. Four world records in 45 minutes. In less than an hour, the 21-year-old tied the world record in the 100-yard dash and then set the world record in the long jump, the 220-yard dash and the 220 low hurdles. It was on this day that he leaped an amazing 26 feet 8 1⁄4 inches through the air, giving him the world record title, one that he held for 25 years. In 1960, Ralph Boston (pictured below), a fellow southerner from Laurel, Mississippi came along and took the title from Owens. Jesse Owens (left) with long jumper Ralph Boston in 1960. Boston had recently broken Owens’ record jump of 26’-11 1/4th” by three inches, putting him in the distinguished company of Owens who won four gold medals in the Berlin games. Ralph Boston (left) with James Pinion, touring the Jesse Owens Museum in Oakville, Alabama. In 1960, at the Mt. SAC Relays, Mr. Boston broke Owens’ world record distance in the long jump event, held by Owens for 25 years.